Twitter has a new partner to try and popularize the concept of sharing and listening to music on the social network. 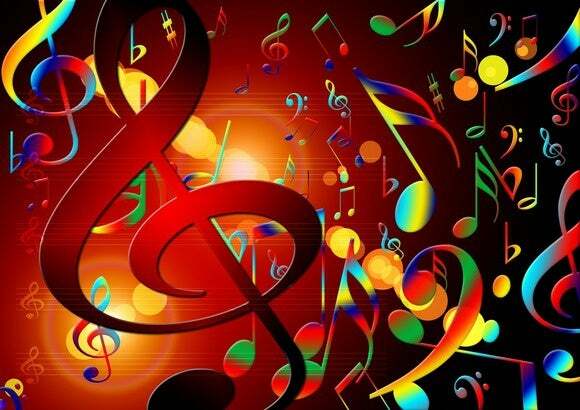 Music streaming service Rhapsody recently announced during SXSW that its members could now share music on Twitter. The new feature takes advantage of Twitter's audio card feature, meaning Rhapsody tunes that pop up on Twitter can be streamed in full directly inside Twitter's mobile apps. Rhapsody says it is the first streaming music service to offer licensed full-track playback on Twitter. 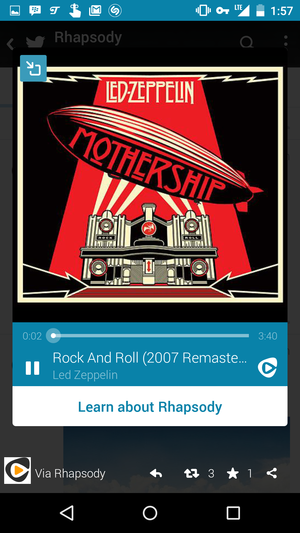 The new feature lets all Rhapsody members share music directly from Rhapsody's apps, the company said. In my tests, however, I couldn't get the feature to work with an unRadio trial subscription. UnRadio is Rhapsody's $5 per month Internet radio service. Full-track playback is free and you don't have to be a Rhapsody member to listen. The new feature only works on mobile apps and doesn't work on Twitter's website. Full Rhapsody song playback in Twitter. The story behind the story: Twitter has been trying to make its platform a hub for music sharing for at least two years. In 2013, the company rolled out Twitter Music, a music-themed version of Twitter, but shut the service down about a year later due to a tepid response. Then it launched audio cards last August with SoundCloud as its first partner in October. Rhapsody, with its hefty catalog of songs and around 2.5 million subscribers, may be the best bet yet into making Twitter a more active hub for music sharing. Paid subscriber-only Rhapsody is not as trendy to use as Pandora, Rdio, or Spotify, but the music streaming service has managed to gain a modest following. In February, the company announced it had 2.5 million paid subscribers across its Rhapsody and Napster streaming bands, up from 1.7 million in April 2014. Taking advantage of Twitter could help the company gain even more subscribers. When a Twitter user streams a Rhapsody song on their mobile device they'll see a link to "Learn about Rhapsody," which could translate into more subscribers as people start sharing Rhapsody tunes on Twitter. It's not clear, however, if Rhapsody has struck some kind of deal with the major music labels that will make Twitter sharing exclusive for the company. Or if we'll see competitors like Spotify introduce the same feature in the coming weeks. If you're eager to check out Rhapsody's sharing feature, open the embedded tweet above in Twitter's mobile app.